I forgot to mention, the other day, that one of my last captures before the great bulb disaster was this fly. Like most people, I'm rather vague about flies which all seem similar, apart from the various blue and greenbottles whose brilliant colour compensates for that annoying buzz. I also kill horseflies without compunction. Once bitten... Finally, I remember an absolutely lethal sort of fly in the grassy uplands of Guyana. I'm pretty sure that Evelyn Waugh describes it, too, in his travel book 92 Days. So I had to look up this strikingly-coloured visitor to the trap, which looks in the top pic as though it's on a diving board at one of those 1930s lidos, wondering whether to jump. I like the way that its yellow livery extends to its toes. It's a Noon Fly according to my best researches, although I will not be surprised if some Dipterist puts me and anyone reading this right on that. Actually, I'd be grateful if one of them would tell me what a Noon fly was doing out at night. A propos of nothing, I must just plug my new book True North, which has just come out - published by Guardian Books/Random House. It should be in 'good bookshops', as they say, or available from net order services. It's my take on the North of England after 22 years of reporting from here. The messages are (a) it's great - the subtitle is In Praise of England's Better Half and (b) to Northerners: be cheerful. Anyway, more today, because last night our porch light was on to welcome both Grannies for supper and it proved a veritable moth trap of its own. Here are some of at least 15 temporary residents: November moths and carpets, I think, but luckily the distance was too great for macro mode and I can say complacently that accurate identification was impracticable. It's not quite all over yet. Penny and I spent part of the weekend making the lovely crossing from Ennerdale to Buttermere along the Floutern pass (pronounced Floo-turn). It's little-frequented at this time of year and my illustrious namesake Alfred W has put off potential explorers by dismissing the section at the head of Mosedale as a quagmire. So it is, but a quagmire with ways through it. It's also rich in this particular variety of 'woolly bear' caterpillar which I shall research when I have time. Some sort of Tiger? Or Eggar? We will see. I've included the end of my sturdy walking pole for scale, and to demonstrate the quality of Mosedale Head mud. The valley is also notable for a large holly which is the only tree in the Lake District to be marked individually by the Ordnance Survey. The reason is simple and understandable when you sit at the head of the valley munching your pie. There are no others to be seen anywhere in the huge view. 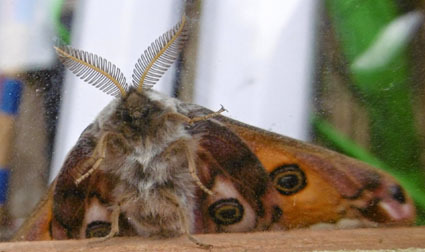 PS I've done my research now, and I think it's a Fox Moth cattie. It looks right and Arthur Ransome, my illustrious predecessor on The Guardian wrote in Swallows and Amazons about episodes based on his own youthful visits to the Lakes, including tickling trout, meeting charcoal burners - and collecting Fox Moth caterpillars on the fells. Two posts in one day, goodness! Unprecedented but also valedictory, nearly. I'm shutting up shop for the year any minute now but just wanted to squeeze in a contribution from an excellent Guardian colleague, Sally Burtt-Jones. She flawlessly organised a readers' walk which we did in Richmond (Yorks) earlier this year. In fact, if you have time on your hands you can read a little more about it, and about suicidal Peacock butterfly caterpillars, in the posts below. 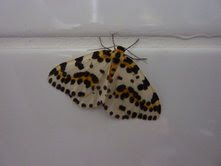 She emailed me in response to a question I had for her earlier this week, saying that she wouldn't reply until I identified this moth, which she had photographed (very well; young people have no problem with camera tremble...), in her parents' bathroom in Wales. No doubt she then ushered it safely out of the house, as in Which? magazine's instructions (see next post, below). Here we are. Not from the Internet but from good old Waring, Townsend and Lewington. There are plenty more variations within the range. My Mum's just bought a new carpet and, aptly enough, my trap is being visited by carpet moths. They are named after their intricate patterns rather than the old and erroneous notion that they eat carpets. That's the job of carpet beetles and a very limited number of 'clothes moths', the Common and the Case-bearing in particular. As the Which? magazine guide to such matters says: "Be careful not to confuse clothes moths with other species which are harmless and should be carefully ushered out if found in the home." These two carpets are the Common Marbled and the Red Green. 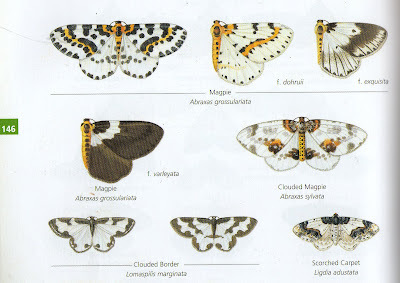 The former appears in many variations, including the one with the orangey blotches as well as the standard type, pictured on the left. Quite a few of them have a habit of resting with their tails pointing up in the air for reasons unknown. The Common Marbled's caterpillars are unusually indiscriminate, feasting on pretty much anything. The Red Green's are more fastidious. They dine on rowan and oak, both of which flourish hereabouts. Penny keeps finding moths in the house, most recently a yellow underwing taking a laudable interest in our print of Hobbema's The Avenue at Middelharnis. I think they must come in on my dressing grown. Yesterday, though, she was a realy David Attenborough. We were having breakfast when she spotted this wasp twisting and turning in the top corner of a window. Window corners are where our many spiders weave their webs, and this one had snared a potentially juicy prey. Don't underestimate wasps, however. We watched, as coldly neutral as the Swiss, while the two creatures grappled. The spider kept trying to tie more twists of silk round the wasp. The wasp twisted and jerked, and was gradually helped by gravity to the bottom of the web, tearing strands as it went. It seemed to be trying to sting the spider but the latter was either too agile or immune. But it was also the loser. Although trailing little ropes of web and silk, the wasp broke free and plunged out of sight.It didn't look as though it would be able to fly though, and we watched to see if the spider would do one of those amazing plunges, spinning out enough silk to make its own bungee jump and carry on the attack. Lady Attenborough went outside to see if it was lying on the ground, but it had gone. The beautiful little prisms which you can see in the middle picture, specially if you click on them, are formed by Yorkshire sunshine catching imperfection in our window glass. At least I think so. I consume vast quantities of McDonald's cappuccino these days (small size only) because I need the wifi as I roam around the North, and McD's is a place with guaranteed free access. Only right, therefore, that I should be visited last night by the Cappuccino moth, aka the Green Brindled Crescent, variety capucina, which isn't terribly striking but has the distinction of being found only in the UK. The standard GBC is more attractive, as it has streaks of bright, metallic green which are completely missing from this variety (see v nice pic below right, courtesy of a really good online gallery of moth pics www.mattslaymaker.co.uk). Named like the coffee after the brown-hooded Capucin monks of the Franciscan order, mine seems to be a melanistic form, judging by the fact that historical records are mostly from industrial areas. Anyway, here it is, another harbinger of Autumn, along with one of my favourite, smart Black Rustics. Tomorrow: the battle of the wasp and the spider... Can you wait?